When Cing Muan Kim arrived in the United States, she was 15 years old. She barely spoke English. And she came here as a refugee, after she and her family were left with no choice but to flee their home country of Myanmar (Burma) due to government conflicts. You’d think that these circumstances would wear heavily on even the most resilient of young minds. Yet, three years later, Kim stood on stage to receive “The Most Courageous Student” award at the Scottish Rite Ballroom and Auditorium, Collingswod, as a round of applause erupted to honor her. The award ceremony was presented by the Camden County Board of Freeholders, who held a “Best of the Class 2017” ceremony in which exemplary students were chosen and honored from every high school in Camden County. 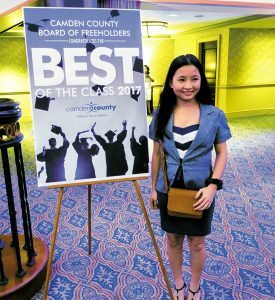 Cing Muan Kim, an 18-year-old refugee from Myanmar who was resettled by Catholic Charities staff three years ago, won the “Most Courageous Student” award for her high school and was honored at the Camden County Board of Freeholders’ “Best of the Class 2017” award ceremony. “I was surprised to receive the award, but I’m honored!” Kim said with a smile. A senior at Haddon Township High School, Kim has not only mastered English, but she will be attending Camden County College in the fall to pursue a degree in nursing. When Kim and her family first arrived to the United States, Catholic Charities’ Refugee Resettlement staff, which includes two Burmese refugees, immediately sprang into action. They picked the family up from the airport, helped them enroll in assistance programs, found housing for them, and assisted them with necessary medical treatment. Kim is one of some 100 refugees that Catholic Charities resettles each year, as the agency responds to Jesus’ call to welcome and embrace the stranger. The Office of Refugee Resettlement Services helps to ease the human suffering of people fleeing the horrors of war and persecution from war-torn and post-conflict regions of the world. The agency helps these newcomers establish new homes, jobs and a new life here in South Jersey, while working to bring them to self-sufficiency.